I’m not a very good farmer. My tomato crop was paltry even before whatever creature ate them all. My herbs all seemed to go to seed before I harvested much and my eggplant, jalapeño, and Italian sweet peppers barely hung on. The creature finally got my two jalapeños but the Italian sweet pepper, which had languished all summer, finally produced one tiny pepper. It grew to about three inches and had turned red by the time I returned from NYC so I harvested and photographed it using the macro lens. 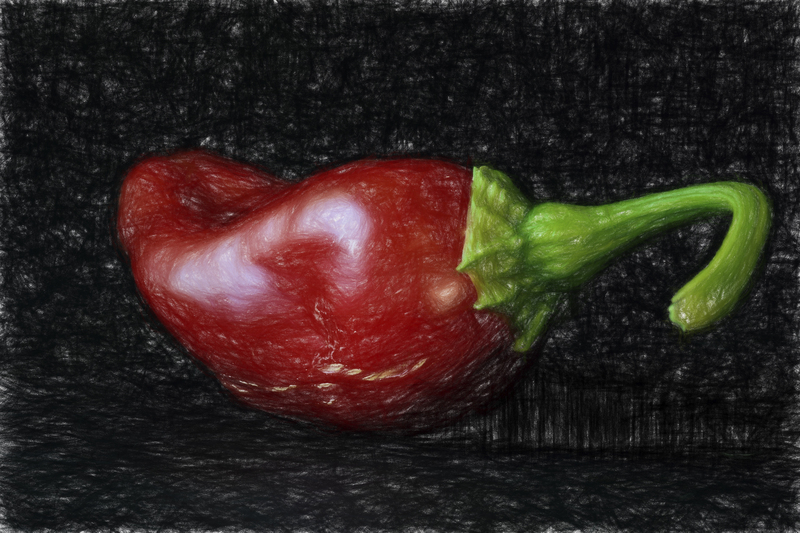 It was just a picture of a pepper so I edited it in Topaz Impression using the colored pencil filter which made it a bit more interesting. This entry was posted on October 4, 2015 by Carol Smith. It was filed under Uncategorized . Very creative- I could see a kitchen series edited this way!